A sneaky preview of of Carina’s June 2018 article! When I was little June was always a very special month. The Cockenzie & Port Seton Gala day for one was an annual highlight of our village. The school children’s houses would be decorated, windows, fences and arches all covered with beautiful paper flowers and the proud name of the Queen or Flower Girls. Living in a village between two harbours added a very different feel to the celebrations. The Gala party would step on board the fishing boats, 20 or 30 vessels would not be uncommon (all fabulously flagged out) and then the race from Cockenzie to Port Seton Harbour would take place. As a girl it was the only day of the year women were allowed on the boats – that old superstition of women and nuns was never forgotten. With the pirate boats at the ready, real gunfire could be heard from the village green. It was wonderful and I’m delighted to say the gala day at Cockenzie and Port Seton is a tradition that’s still going strong. This years date is 26th May so put it in your diary. And it is their 69th anniversary which is truly fantastic. The Pond Hall may not be there for the afterwards tea and buns but the spirit of the day is still thriving. For my parents the day meant far more. If the sun shone then Daddy would signal a move from the red of the winter into the black. Coastal ice cream trade depended on a good summer. If it was raining then gallons of ice cream mix might be wasted and the black would have to wait for the next Gala day. They were banking on selling loads of ice cream cones, catering for the tea dance and if they were lucky they had the gala bags to prepare. We spend our Friday and Saturdays in June preparing for the gala days at Longniddry, Macmerry, Port Seton and the biggest of them all was Wallyford. For the Wallyford Gala we’d have to make over 1200 gala bags. Each with a pie, an orange, a kit Kat, a mars bar an empire biscuit, a packet of crisps and wait for it, a 50p. To get a Wallyford gala box (there’s were so generous they had to go into a box not a bag!) was like winning the lottery. I’d only get one if there were any left over. But dear Bobby Moise, one of my fathers friends who organised the day never let me go without. Inside the box was also a ticket. And the ticket was for an ice cream. My brothers would be on hand in the kiosks – two were required for this day as it was so busy. Cone after cone after cone. The competition would be to see who could hold the most at any one time in your hand. I remember 8 was my magic number. Eight cones every few minutes. It was Piccadilly Circus Ice cream! Busy busy busy. The other highlight of June was the start of the open air swimming pool season. It’s wonderful to read the revival of the Lido. Open air pools were built in seaside towns in the 1920’s and 1930’s all over Scotland and the UK. North Berwick, Portobello and Port Seton boated some of the best. Ours in Port Seton boasted a pool almost of Olympic scale less a few inches. It had a beautiful fountain at the children’s end and diving boards at the deep end. It’s so sad that we’ve lost most of these due to changes in fashion over the 1980’s. If only we’d held onto them I’d be looking forward to my first dip at 69’ F (it was absolutely freezing) but by far the best, cleanest swim I’ve ever had in my life. Filtered sea water that was crisp and fresh. My whole family are strong swimmers based on this tough regime of cold salt water. It was world class. Stonehaven still boasts its Lido. I look forward to coordinating some good weather with a trip up the east cost for a splash of memories of the best outdoor food life. Wish me luck with the weather, maybe that was the change in fashion. 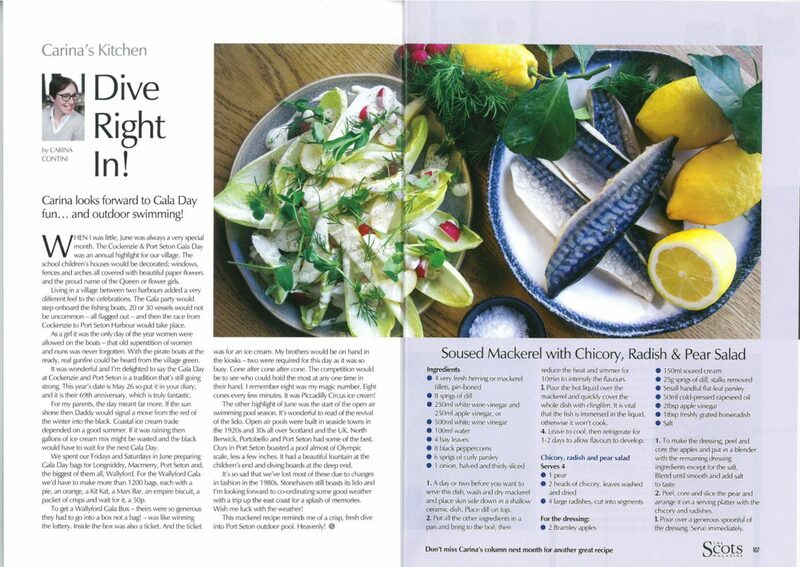 This mackerel recipe reminds me of crisp fresh dive into Port Seton outdoor pool. Heavenly!